Orrest Head and Elleray Wood formed part of the Elleray Estate which was formerly owned by Arthur Henry Heywood. In 1902 his widow and daughter gave Orrest Head in trust to Windermere Council to be held "for public walks or pleasure grounds". In 1943 most of Elleray Wood was given to the Council under similar terms by other members of the family. A small part at the northern end is owned by South Lakeland District Council but leased to the Town Council and managed as part of the Community Woodland. The wood covers an area of approximately 18 acres to the north-east of the A591 Church Street, and was probably laid out in the nineteenth century; many of the original pathways and carriage drives are still used and are in relatively good condition. The Town Council now manage an area of 30 acres of woodland and have, for some years, worked to actively cut back and pollard the over-grown and densely packed woods, with the aim of bringing the woodland floor back to life. This has started to happen - bluebells are back in profusion, there are clear signs of small mammals and birdsong has returned. Recently, the Lake District National Park restored a large part of the old Victorian Carriage Drive, improving access to the less mobile. 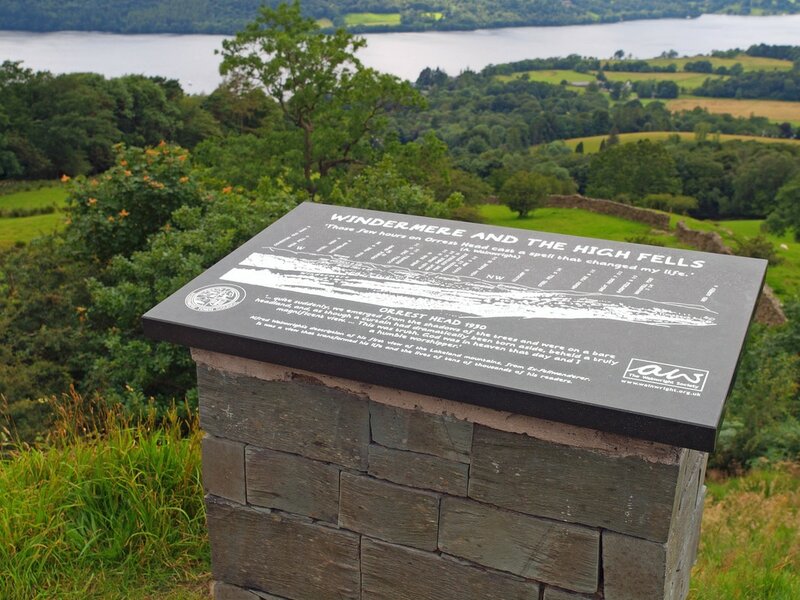 In 2012, the Town Council worked with the Wainwright Society to replace the view-finder at the top of Orrest Head. The new view-finder, in local slate, engraved with the Wainwright drawings and script is a fitting enhancement to such a lovely place and a celebrates the memory of Alfred Wainwright, who fell in love with the Lake District on this spot. The Town Council will continue to enhance and improve this woodland, and make it available for locals and visitors alike to enjoy and be inspired by.